New Episodes of Bee and Puppycat Are Here, Hooray! For those that don't know: Bee and Puppycat is a show by Natasha Allegri, a character designer and storyboard artist for Adventure Time. If you like Adventure Time, Sailor Moon, or cute things, chances are good you'll like this show, too. 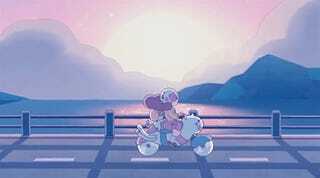 The premise is basically: a young woman goes on intergalactic adventures with a mysterious creature called Puppycat, all in the name of paying rent and getting by (yes, part of the show takes place in the real world). But, that's sort of like saying Adventure Time is about a boy and his dog. Technically true, but it's a description that misses a lot of the charming elements of the show. You kind of just...need to watch it. Puppycat is such a cute brat. Ughhhh. If you liked these episodes, and haven't happened to watch the originals, you should! If nothing else, they set up the fiction/world better, and you get to see how Bee landed on her special temp job situation.